Metallica are streaming video of a September 26 performance of their 1991 classic, “Sad But True”, filmed during Dreamfest outside City Hall in San Francisco, CA. The track was the fifth single of the group’s self-titled record, the band’s first to top the US charts on its way to sales of 16 million in the States and more than 30 million worldwide. More than two decades since its release, the project recently made US chart history by becoming one of only four albums to spend more than 500 weeks on the Billboard 200. 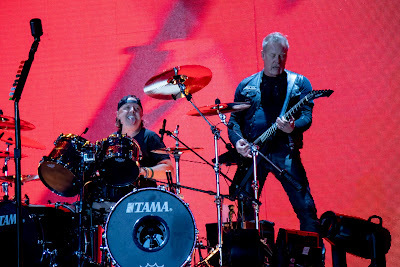 “Metallica” – aka the “Black” album – achieved the rare feat alongside Pink Floyd’s “The Dark Side Of The Moon” (937 weeks), Bob Marley and The Wailers’ 1984 collection “Legend: The Best Of Bob Marley And The Wailers” (539 weeks) and Journey’s 1998 “Greatest Hits” package (539 weeks). The veteran metal band’s fifth record continues to hold the record as the biggest-selling album in Nielsen Music history, since the company began tracking sales data in 1991.